With vast experience, we have carved a niche for ourselves as a manufacturer, exporter and supplier of Diamond Core Drill (Z1Z-TK02-255C) from Yongkang, China. This Diamond Core Drill comes with a two-gear rotary speed with gear specifications of 950r/min and 500r/min for top and bottom gear respectively. This Diamond Core Drill is widely used for materials such as reinforced concrete, brick and other construction materials and is preferred for drilling in walls, floors, roofs and road surfaces. The Drill is offered with a safety clutch and adaptable water spigot. 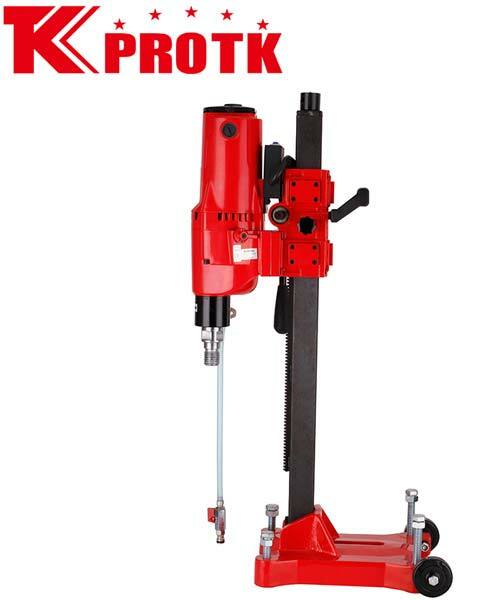 This Drill comes with a Big C type base with wheel which helps in improving the efficiency of the Core Drill. This Core Drill requires an input power of 2450/2600W and is offered in packaging size of 103x33.3x43.8 cm each. Big C type base with wheel.